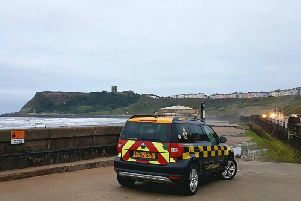 North Yorkshire County Council have announced that a road closure in a coastal village has been lifted after repair work was completed ahead of schedule. Work to tackle a second landslip at Stoupe Brow, Ravenscar, is now under way, but the road will remain open as a tarmac diversion has been laid around the working area. The first landslip caused a crack across the road which was dug out and gabion baskets (metal cages) containing stones were installed over a 40-metre length to make it more stable. The road was then resurfaced and reopened on Friday (February 1) and residents had been using the disused railway line at either Fylingthorpe or Boggle Hole for access. County Councillor Don Mackenzie, executive member for highways, said: “We fully recognised the inconvenience caused to the households close to the landslips. We made every effort to carry out difficult reinstatement work as quickly as we possibly could.